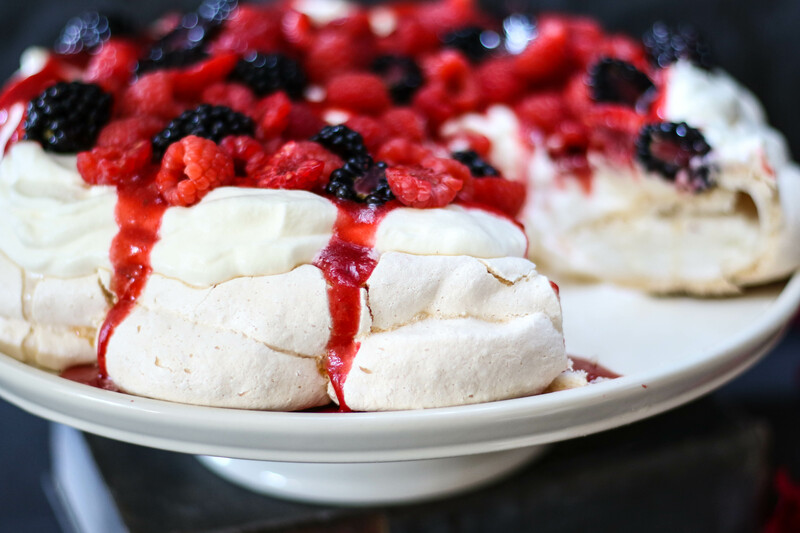 A pavlova is a beautiful dessert piece for the Christmas table. It’s a breeze to make and assemble and you can even make the meringue base the day before if you’re pressed for time and too busy stuffing a turkey and frying potatoes in duck fat. Dressing the pavlova is the best part. It’s really up to you what flavours and textures you’d like to go with. I’m a big fan the classic berries and cream. 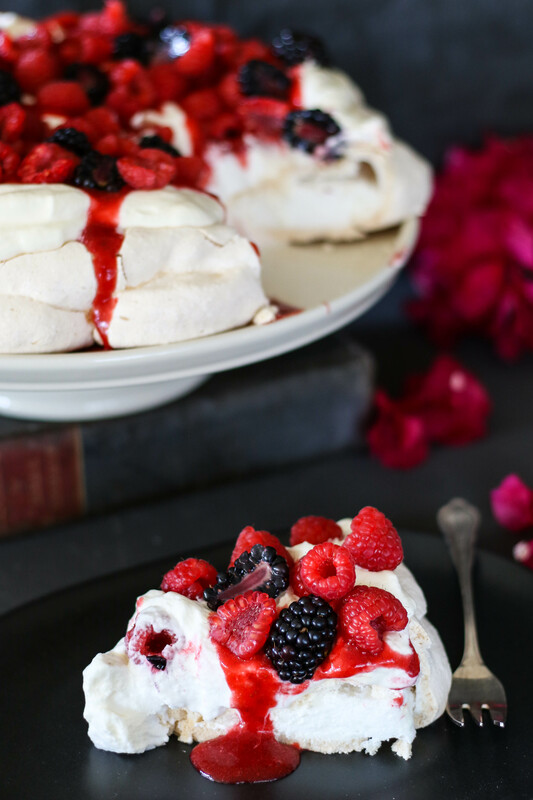 I love the tartness of the berries with the sweet meringue, add a hint of vanilla to the cream and i’m in tastebud heaven. I do not add any sugar to the cream itself. A traditional Chantilly cream would have vanilla and sugar in it but I feel the meringue itself is sweet enough. You could go the tropical fruit route and fill your pavlova with mango slices, kiwi and fresh granadilla. Or something rich and luxurious like a chocolate cream with salted caramel, poached spicy pears and toasted hazelnuts. It’s a blank canvas so you can play as much as you like. 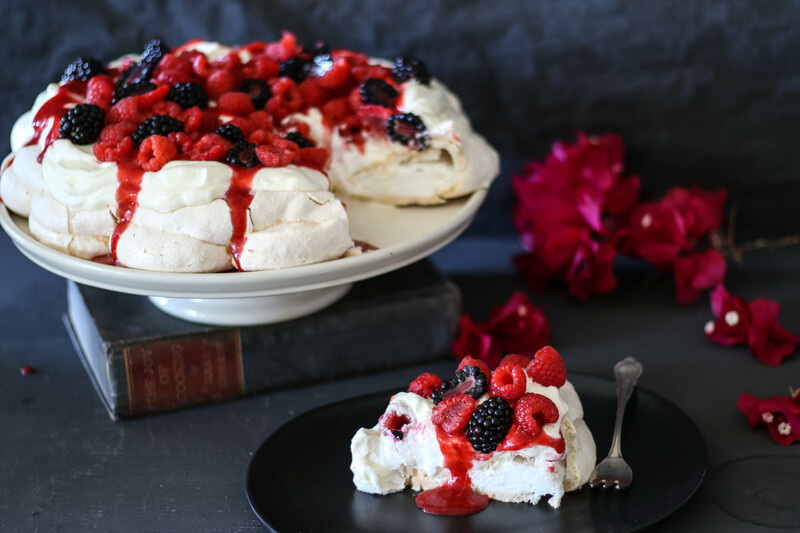 My favourite part of a pavlova is that it acts as table decor! It’s beautiful and will stay crisp for quite sometime if you dress it at the last minute. Be the host with the most this festive season and make this glamorous dessert for your loved ones. Separate eggs. Pour whites into a clean and dry mixing bowl or into the bowl of an electric mixer. You can wipe the bowl with a dash of vinegar to be sure there are no traces of grease. Beat the egg whites and cream of tartar until light and foamy. At this point gradually shower in the caster sugar bit by bit. Continue to whip until thick and glossy. Finally add the corn flour and vinegar and finish the meringue off to stiff peaks. You should be able to turn the bowl upside down without fear of it landing up all over your floor. Fold in the teaspoon of rosewater gently without knocking any air out of the meringue. 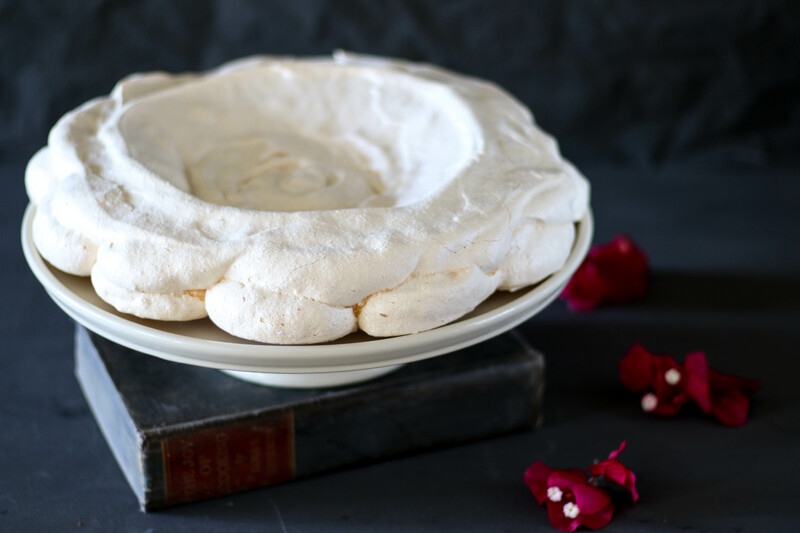 Dollop the meringue into a circular shape on a baking tray lined with a silicone mat or baking paper. Make sure the sides are quite high and then using a spoon spread some meringue in the centre of the circle to hold your filling. Bake the meringue at 120˚C for 2 hours and then leave to cool. While the meringue is baking make the berry coulis. Place your choice of fresh or frozen berries and lemon juice into a small saucepan. Add a scant tablespoon of caster sugar and cook down until the berries begin to disintegrate. Finish with a generous splash of brandy and then blend using an immersion blender. Once the meringue is completely cool whip the cream and vanilla until soft peaks. 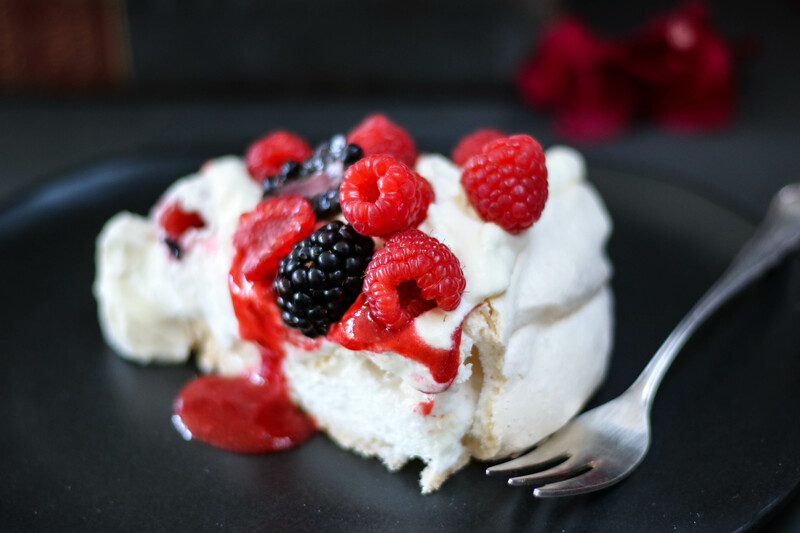 Spread some of the raspberry jam into the centre of the pavlova. Spoon the cream on top of the jam and then drizzle with the coulis and top with fresh berries. Nice, but could use an AT-DP to really set it off!